As December 31st, 2016 brings another year to a close, it subsequently closes world-famous restaurant Noma. Following four consecutive crownings as Best Restaurant in the World, the closure came as a shock to the entire industry. But for the restaurant’s Commander-in-Chief Rene Redzepi, it was more about the time to ask “What’s next for Noma?” Redzep explains that the restaurant’s transition brings closure to early experiments and makes room for new goals - refocusing the team’s desire to redefine food in the Nordic region. The new restaurant will draw inspiration from the three seasons in Scandinavia, infusing a farm-to-table style, and sinking the restaurant flavors deep into the region’s earth. After 12 years of crowning achievements as top chefs of the Nordic region, Redzepi and his team are moving their new venture to Freetown Christiania, building an urban farm, reinvigorating their flavor as well as evolving their fermenting kitchen. Redzepi made it clear that these new evolutions would be loyal to Noma’s early goals: Be authentic, local, and define food in the Nordic region. How do we think it will perform? A better question is: Who wouldn’t want to drop in and find out? With a following as strong as Noma’s, growing its new 3-season format, and expansive urban garden to compliment foraging, we expect the restaurant’s palette will thrive. But the location itself raises some eyebrows. Though they will be stepping into a newly imagined space committed to the modern experience of Scandanavian cuisine in the Nordic region, there are uncertainties as to how the restaurant will integrate into the personality-filled Christiana community. A self-governing autonomous neighborhood within the borders of Copenhagen, Christiana’s community is highly independent and centered around yoga, meditation, and general artistic expression of all forms. Will the growth of the restaurant feel like a threat to locals? Will the influx of affluent foodies and their potential to gentrify be welcomed? Will they just be brushed off as tourists? Or will the locals practices be put into practice? Will they all breathe together in harmony? Will Redezepi’s commitment to the ground they all walk inspire all? Food has a tendency to bring people together. We have a strong feeling this will be no different. 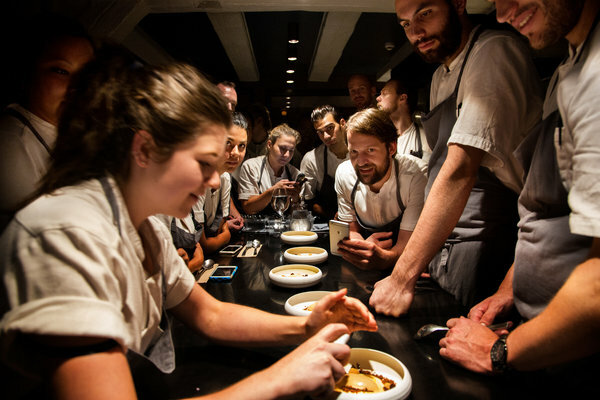 Redzepi admitted that he “previously allowed the format of a tasting menu to dictate what we cook.” It was time to re-think produce, growing, and a workplace for his team - while still striving for quality, and evolving as a group. Although 2016 will be goodbye to Noma in its current form, the team retains a distinct loyalty to their original goals - showing passion to innovate and even-better define the region through food, despite ongoing success which can make some complacent. Understanding the labels that define a region - culinary or otherwise - is a massive task. Closing a most successful restaurant and moving to the famed Freetown Christiania in the pursuit of evolution shows a 360 approach and a pioneering spirit, connecting both the chefs and customers to the region through food. Their new permutation will only further delve into foraging and fermenting, to compliment the building blocks Redzepi and his team drew from Noma 1. Cooking by season, growing all produce on their doorstep, or foraging everything from their region exemplifies the restaurant’s loyalty and dedication to their landscape’s identity, and should mesh seamlessly with the free-minded spirit of the Freetown region. Know when it is time to step back and reframe. It is always possible to grow and reinvigorate your passions. Make the jump. But hold firm to the founding ideals in the heart of what you do. Undoubtedly fertile soil to grow their new venture. Chefs are artists and designers of visceral experiences. Both of these fields draw inspiration from what is around them. Redzepi’s vision is no different. The new experience will acquire learnings from farm-to-table eateries in upstate New York to build an urban farm in progressive and personality-filled Freetown, Denmark. An intriguing contrast to unite. 3. Loyalty comes from creating Circular Value Exchange. Through the visceral experience of food, Redzepi and his team connect their patrons to the piece of Earth they stand on. The urban farm-to-table experience creates inspiration for the chefs, and grows Danish culinary prowess, as well as that of the Nordic region and the industry as a whole. Modern Loyalty lives in the multiple layers of growing emotional engagement and connection.